While Ariela had both a Rainbow Loom and the bands to use with it back in Chicago, we decided that it would be best to contrast the knitted prototypes with a Rainbow Loom prototype. So I borrowed one from a family with 9 year olds and grabbed some bands at our favorite local kids store. After testing the quill cozies, we moved on to the Rainbow Loom. For those reading without medium* children, a Rainbow Loom (or its generic equivalent) is a device designed to hook small colored rubber bands together to make various objects. Generally these objects are bracelet-like, but apparently Ariela had found some instructions for making pencil grips on the internet and we went with it. 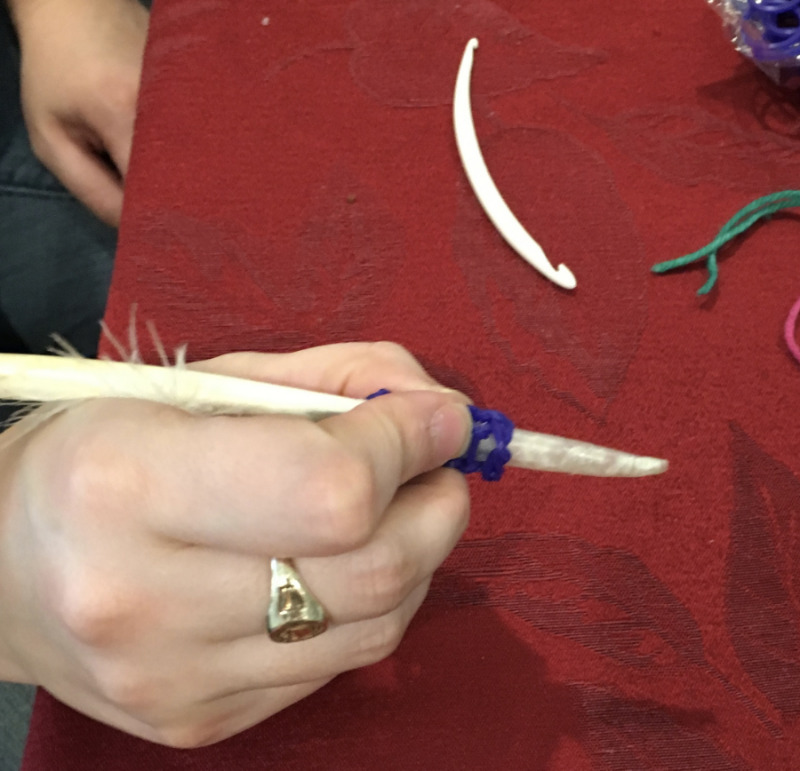 Creating a grip over the quill. It's an interesting process. I had assumed that the yarn venture would have been a lark, and the grippiness** of plastic would win out. The fact that yarn can absorb ink and plastic can't seemed to be another point in its favor. However, Ariela feels that the plastic one would end up getting very sweaty. And since she's the ultimate user of the product, her comfort is one of the most important factors. Testing... Testing... Good concept, but not right for the end user. Next up will be seeing the revisions to the knitted prototype! *7-10 years old is the target demographic. That age no longer qualifies as small, in my opinion.